Beer, salad, cheese spatzle with onions for me; 19 inch brat, salad and potatoes for MM. Yum! And free wifi! The wifi at the hotel kept dropping me, so I did not post a photo this morning. I was just happy it would get a message out. We enjoyed our hoho bus tour of Berlin. We will go back out tomorrow and add a local cruise to the touring. Y'all know MM always wants to be on the water! We will enjoy it. He is finished with his dinner and eating on mine. It's a good thing I don't mind sharing, bless his heart. We will head back to the hotel and watch the Olympics. We are such party animals! That dinner looks mighty good. 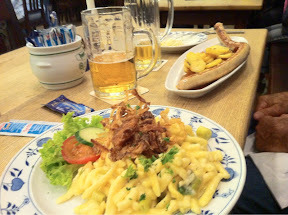 I love German food. A. Lot. Holy moly! That's a big hot dog. Pass the Pepcid. Sleep tight and have a great day tomorrow!!!!! sarge loved german food better than anything! that looks wonderful! Yum! We look forward to taking the girls to Europe... one day! Thanks for taking us along for the ride.